If you sell or supply food for retail sale in stores, markets, online or from vending machines it is likely that you will be required to comply with the Country of Origin Food Labelling Information Standard 2016 (Standard). fresh fruit and vegetables in transparent packaging. not for human consumption (for example, pet food). Businesses may voluntarily choose to provide country of origin information for food that is exempt from the Standard, provided it is not false or misleading. 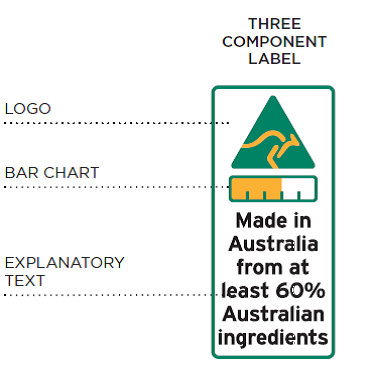 However, if a business wishes to use the kangaroo logo or the bar chart on food products to be sold in Australia, they will be required to comply with the Standard regarding the use of those graphics. was grown, produced, made or packed in Australia or another country. It is important that businesses understand the distinction between these terms so that they can label their products correctly. All other foods (for example, meats, fruit and vegetables, bread and dairy products) will be priority foods. If a business is unsure whether a product is a priority or non-priority food, they should consider erring on the side of caution and labelling the food according to the priority labelling requirements. A claim that a product was ‘grown in’ a particular country is generally used for fresh food (for example, fruit and vegetables) and means that that food was in fact grown in the country claimed. Foods with multiple ingredients can also generally claim to have been ‘grown’ in a specified country, as long as all significant ingredients are from that country and virtually all processing occurred in that country. However, a priority food can only claim to have been 'Grown in Australia' if it contains exclusively Australian ingredients. Claiming that a food is the ‘product of’ a specified country means that all significant ingredients in the food as from the specified country and virtually all processing has been done in that country. This claim is commonly used for both fresh and processed foods. Like the 'grown in' claim, a priority food can only claim to be a 'Product of Australia' if it contains exclusively Australian content. The ‘made in’ claim means that food underwent its last substantial transformation in the country specified (this doesn’t necessarily mean that any ingredients are from that country). Depending on the circumstances, the Standard may require, or permit, a food to be labelled with information about where it was packaged. A food that cannot claim to have been grown, produced or made in a particular country will generally be labelled according to where it was ‘packed in’. a statement identifying whether the food was grown, produced or made in Australia and in the case of 'made in' claims, the percentage of Australia ingredients in the food. 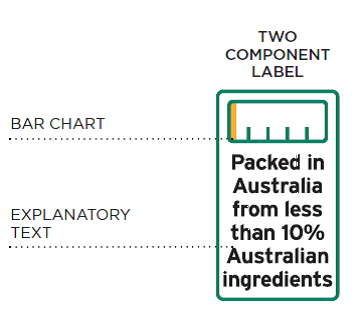 a text statement with an origin claim for the food and identifying the percentage of Australian ingredients in the food. Country of origin statement – a text-only label which is used for non-priority food items. Imported priority foods must also, as a minimum, carry a country of origin statement in a clearly defined box (a box is not require if the food is unpackaged). An online decision tool developed by the Department of Industry, Innovation and Science is available to assist businesses to generate downloadable labels for free. Use of the tool is voluntary and businesses must take care to ensure that, for any labels generated, the business is complying with the Standard regarding the use of that label. It’s important that businesses comply with their obligations under the Standard. The ACCC, in conjunction with the National Measurement Institute, will be conducting market surveillance checks to make sure businesses are complying with the Standard. The ACCC also has the power to call on businesses to substantiate their country of origin claims. However, the ACCC is aware that some businesses may experience practical challenges as they adopt the new labels for their food products. While the ACCC cannot provide exemptions from the law, we do have discretion about the matters we investigate or how we resolve concerns. Where we identify possible non-compliance we will take into account the surrounding circumstances. For example, the ACCC will generally distinguish between genuine efforts by a business to comply, and a business that makes false or misleading origin claims. The ACCC is unlikely to take enforcement action where a business has taken steps to prepare for the new requirements, is responsive to our concerns and agrees to timely remediation. In the first year, the ACCC will look to resolve most matters by providing businesses with information and seeking changes to address non-compliance. In line with the principles set out in our Compliance and Enforcement Policy, we will escalate matters for an enforcement approach where stronger action is warranted. the issues go beyond a failure to comply with new labelling requirements and involve conduct or labelling that is likely to mislead consumers. In addition, the ACCC is more likely to take action where such conduct is undertaken by large or national traders and the conduct impacts a large number of consumers.